Max Weber (1864-1920), the sociologist extraordinaire who was not in any way affiliated with a certain brand of barbecue, was once responsible for many astute social observations. Over the years, as he steadily gained a heavy arsenal of such reflections, he built up a formidable reputation as one of the founding fathers of sociology. Of particular interest was his study of bureaucracy. In his view, as a society became more and more advanced, so too would its administrative organs. He never seemed to dwell with any particular zeal on the horror of such an idea – that the world could perhaps become one, giant Canberra, swarming with public servants – but there were others that did. Franz Kafka (1883-1924), the Czech author extraordinaire who was also not affiliated with this aforementioned brand of barbecue, was one individual that most certainly did. Despite the brevity of the period during which Kafka graced this earth – a mere 40 years – and his subsequently small oeuvre, his work has become synonymous with the kind of nightmare inadvertently described by Weber. His is a world where rotten, indecipherable bureaucracies roam free, of lone protagonists and modernist dystopian undertones in which humankind itself has become mechanised. Set to the rhythm of many lengthy sentences, his macabre imagination has delighted many and spawned the clumsy neologism ‘Kafkaesque’. Many years later, his work was echoed, in part, by the misfortunes of one Winston Smith. Whilst some have tried to directly adapt Kafka’s fiction to the screen, such a task has not been particularly successful. Nevertheless, his ideas themselves are incredibly amenable to such translation. Steven Soderbergh’s Kafka (1991) is one shining, successful example of this capacity. It is itself not a direct adaptation of any particular story but instead a deftly woven tapestry of Kafka’s own life, his novel The Castle and various Kafkaesque themes, tropes and imagery. 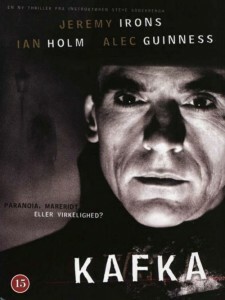 Jeremy Irons here is Kafka. Working as an insurance clerk by day and writer by night, he and his temperament oscillate between indifference, boredom and disbelief as he endures a profoundly mundane existence. One day, awoken from his state of boring stasis, he suddenly finds himself promoted, embroiled in an underground terrorist organisation, chased by humanoid monsters and vaguely in love all at the same time. Somehow this uncanny chain of events leads him and an explosive suitcase into the Castle, a formidable and mysterious structure into which few are allowed entry. Once inside, offices are blown up, certain bureaucrats are maimed and unfortunate truths are grudgingly accepted and life hastily returns to normal, to Kafka’s especial surprise. Amidst this deliberate chaos nothing really makes much sense, but nor is it meant to. It is a perfect bureaucratic nightmare. Kafka has been constructed in a particular manner that mimics the experiences of its protagonist. At every turn is a puzzle missing at least one, integral piece. Nothing is certain. Everything is a little terrifying. One quickly loses sight of any overarching plot, as does Kafka himself. We too, become lost in this labyrinthine narrative only to emerge on the other side technically none the wiser but very entertained. Complementing such a storyline is a particularly gloomy aesthetic. This sort of perfect simplicity, a very clean and functional beauty, is well known for its use in Science Fiction films like GATTACA (1997) and Alien (1979). It also features strongly (albeit in a more filthy incarnation) in Terry Gilliam’s Brazil (1985). In Kafka, the employment of such visuals forces a storyline that seems initially to be quite mundane to take on more sinister undertones. In this way, the film acquires a dystopian mood well before the true horrors of the Castle and its doings are revealed or even suspected. Unlike so many Hollywood features in which the mise-en-scène is by comparison a non-entity, Kafka’s impact would be lessened significantly without its carefully chosen aesthetic. Naturally, Kafka is not without fault. It ends, unfortunately. After having had sucked you in for an hour and a bit, it ceases to be and this quite distressing given the inclusion that one has felt in this alternate reality. But we have to be realistic. The Neverending Story (1984-1994), the title of which must certainly win some award for being cinema’s best lie, ended; a sin for which its kitsch theme could not atone for. Kafka does thankfully end well and on a very confusing note at that. Perfection. This entry was posted in Film, Uncategorised and tagged film, kafka, sociology, weber. Bookmark the permalink.